With Adlens® Adjustable™ you can see up close, into the distance and all around you, at the turn of a dial. 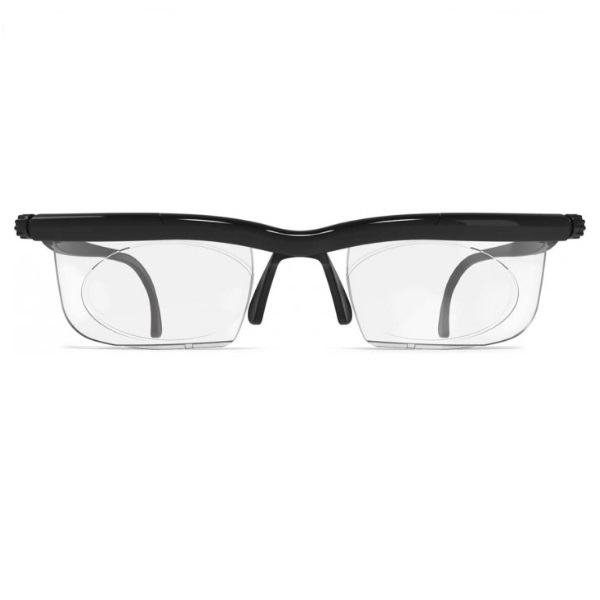 Featuring continuously adjustable lenses these durable and lightweight glasses are perfect for any task. The power of each lens changes when the two parts move relative to one another. Adjust for any distance near to far. Smooth adjusting mechanism and comfortable fit. Two wave-shaped plates slide across one another as you turn the dials, changing the power of the lens. Turn the dial to instantly adjust each lens for near, intermediate and distance vision. -6 to +3 diopter range on each lens. Each lens can be adjusted individually, making them the perfect spare pair. Perfect for reading, watching TV, gardening or any other activity. These eyeglasses do not correct astigmatism and are not prescription eyeglasses. Lenses made from polycarbonate, the most impact-resistant material on the market. Comfortable unisex frame made of flexible and durable high memory material.